The April 11th Missouri/Kansas Fishing report is up at the Kansas City Star website! Unfortunately there wasn’t much to report due to the extreme fluctuation in temperature. Both Missouri and Kansas saw air temps drop into the teens over the past weekend, which shut everything down. This coming weekend will only be slightly better, but not by much. The Lee’s Summit Area Fishing Facebook Group is over 400 members in less than a month and a half. 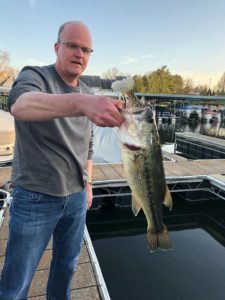 Member Steve Curd found this big bass floating in Raintree Lake, still alive, with a crappie it tried to eat. The bass was released, but the crappie didn’t make it. Fishing, Fishing Report, Kansas, Kansas City Star, Missouri, Tyler Mahoney. Bookmark.